This class 3V, potential class 5 patient came to our clinic in the winter of 2007. This patient’s hair loss pattern was somewhat similar to a Ludwig pattern. This pattern is an overall thinning that is typical of female hair loss. The patient has about average donor density of 180 hairs per square centimeter. 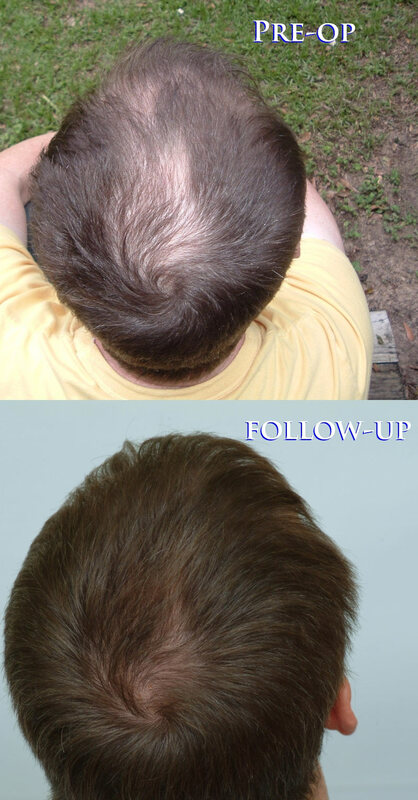 Years prior to treatment, the patient began using Finasteride to maintain native hair (non-transplanted). The patient’s goal was to obtain conservative, natural looking coverage to the top and front region. Our surgical team successfully transferred approx.1040 CIT grafts to the area. The patient is now wearing a long hair style without looking too thin. In the future, the front and top may be thickened to increase density if necessary. Our outlook on aggressive procedures is that these procedures may aide in over taxing patients’ donor resources. The purpose of conserving donor resources and medical therapy is to enable patients with an optimal chance to combat additional loss. A long term and short term plan should be given to all patients. Patients should be given recommendations along with the pros and cons of procedures, all possible side-effects, and pertinent hair restoration information. This happy patient is now able to wear a long or short hair style with confidence. The patient may be satisfied with the results, but can always add more density. This is damn good using only 1040 grafts. Dr Cole should offer a course on donor preservation to other doctors, this is the best example of how a small # of grafts can make a big improvement. » is the best example of how a small # of grafts can make a big improvement. These are the photos that should be posted more often, real testament of what a good doctor should be capable of doing without robbing the patient’s donor bank. I have noticed that Dr. Cole has moved away from large (3K and above) sessions and we do not often see him dealing with NW5s anymore. I recall that he reported that high density large sessions were problematic when looked at scientifically. Could you tell us if this is part of his thinking? Do you have more pics or even a video? I love the 3-peak hairline design. More patients should go with this design, imo. The C-shape or a straight hairline can often be an HT “tell”. Breaking up the hairline shape makes most good HTs look even better, imo. I had it done myself at another clinic. Kudos to the doc and patient. » I love the 3-peak hairline design. » More patients should go with this design, imo. » The C-shape or a straight hairline can often be an HT “tell”. » Breaking up the hairline shape makes most good HTs look even better, imo. » I had it done myself at another clinic. » Kudos to the doc and patient. » He should be thrilled. Good point, it def looks natural. Two thumbs for use of grafts. I am a bit skeptical of the brighter "flash"ier pre-op pics as compared to the post-op pics. Can we see graft placement? And Dr. Cole, what is your opinion on the yield rate here? And what is the average yield rate with fue these days? » Do you have more pics or even a video? I don’t have a video yet. i will check on monday if we can get more photos…the after photos were sent by the patient. it’s not taken by us with our camera, so we will have to ask him for more photos. I had a consultation with another doctor and he said I needed 1500 grafts, my hair loss is nowhere as bad as this guy and he only needed 1040 grafts to look this good, is that possible? this guy was the perfect propecia candidate for me. He should try prop and then think of transplants.Where were the grafts placed overall? Good point, I guess it uses up fewer grafts too than the C or U shape design, there is less area to cover and you still get to frame the face nicely. Good job Dr. Cole! You can’t beat that, only 1040 grafts for such a big difference, do you have more pictures? forhair does dr cole do all the procedures himself or he has other doctors helping him? i think he used to have dr bisanga and dr mwamba working for him, is he now a one man show? i wanna know if this was done by dr cole or by some other doctors who work for him. gr8 result! » » I love the 3-peak hairline design. » » More patients should go with this design, imo. » » The C-shape or a straight hairline can often be an HT “tell”. » » I had it done myself at another clinic. » » Kudos to the doc and patient. » » He should be thrilled. » Good point, it def looks natural. » "flash"ier pre-op pics as compared to the post-op pics. » yield rate here? And what is the average yield rate with fue these days? why is it that the placement photos do not show any work on the hairline, is stricly on top? » is stricly on top? Good camera work - flash in the 1st photo and dull in the 2nd. 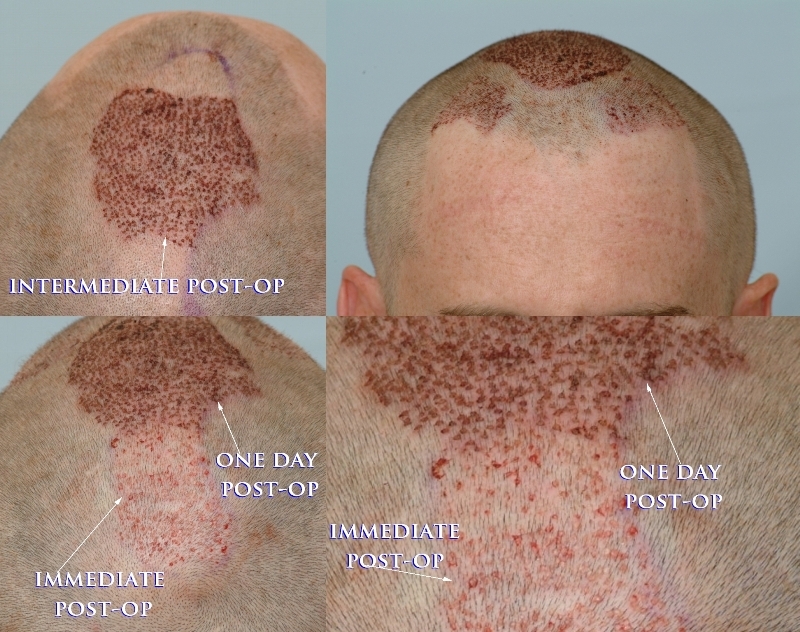 Below are photos that depict the immediate post surgery result and the one-day healing result in the recipient areas. While most of the grafts were placed on top, we methodically carried out the desires of the patient. The focus was to conservatively fill in the crown, add light density in the temporal recessions with most of the attention placed on the “bridge”. Usually we don’t add aggressive coverage in the crown simply because additional hair loss may occur at ANY time and may cause the entire perimeter of the area to widen. The treatment of the frontal area was enough to satisfy this particular patient as well as improve the overall density which creates a more full yet soft appearance. Even today, a large percentage of patients come to our clinic after they understand that more hair does not equate to a better result. 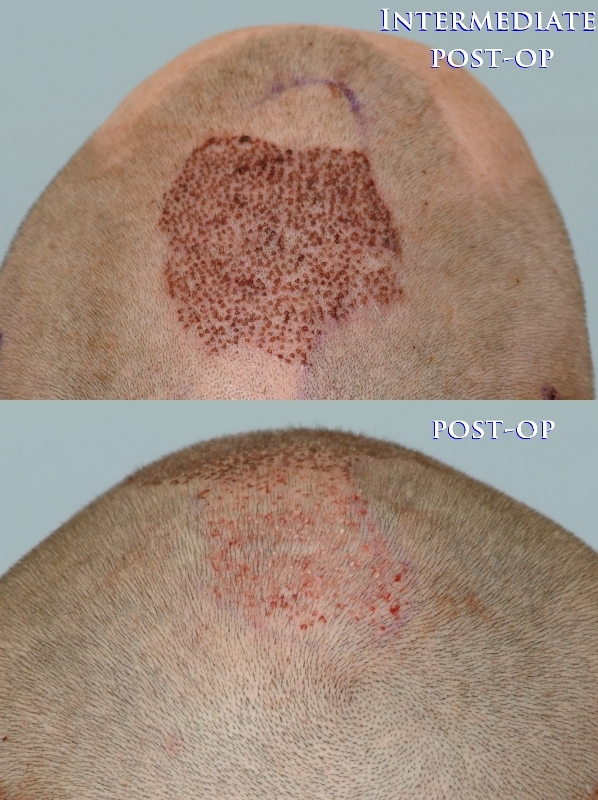 Keep in mind that the after effects of bad hair transplant procedures are not usually seen until the next anagen cycles of the donor follicular units begin. These same patients come to us and entrust us to perform corrective treatment of the previously treated recipient areas. There are several scenarios that may occur after patients leave our office. 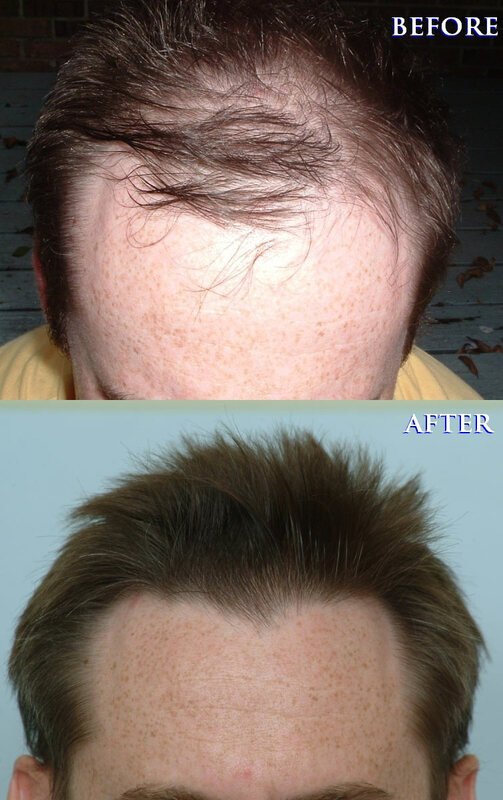 They may want to return for a touch-up, they are satisfied and don’t return for many years, or they become pre-occupied with their satisfactory results and want to move toward other goals in hair restoration. » » is stricly on top? » Good camera work - flash in the 1st photo and dull in the 2nd. Hi Plughead. I can’t help but ask: What exactly do you mean by stating “Good camera work”? Also, could you please expound on what you are refering to as “flash in the first” and “dull in the 2nd”? I don’t want to assume that you don’t quite understand what is being shown in the previously posted photo showing final graft placement and the one-day (intermediate post-op) healing result.